Sri Ramakrishna Advaita Ashrama, Kalady is the branch centre of the internationally well known Ramakrishna Math and Ramakrishna Mission. It is located in Kerala State in South India. It was started during the Sri Ramakrishna Centenary year 1936 on the auspicious occasion of Sri Sankara Jayanthi Day (26 th April,1936). Thus in the land of Sankara, Vedanta found the fullest expression in its own ways. He traveled in South Kerala temple to temple giving spiritual talk . He started a Gurukul started with 4 inmates which later had a steady growth. The Sanskrit School started in 1937 with 3 students in the name of Swami Brahmananda , the spiritual son of Sri Ramakrishna. It later became a full – fledged High School by 1940. In the year 1941, after the visit of Swami Madhavananda , the then General Secretary of the Ramakrishna Math and Mission, the Ashrama was affiliated to the Belur Math, the headquarters of the Ramakrishna Order, and was made a branch Math Centre. 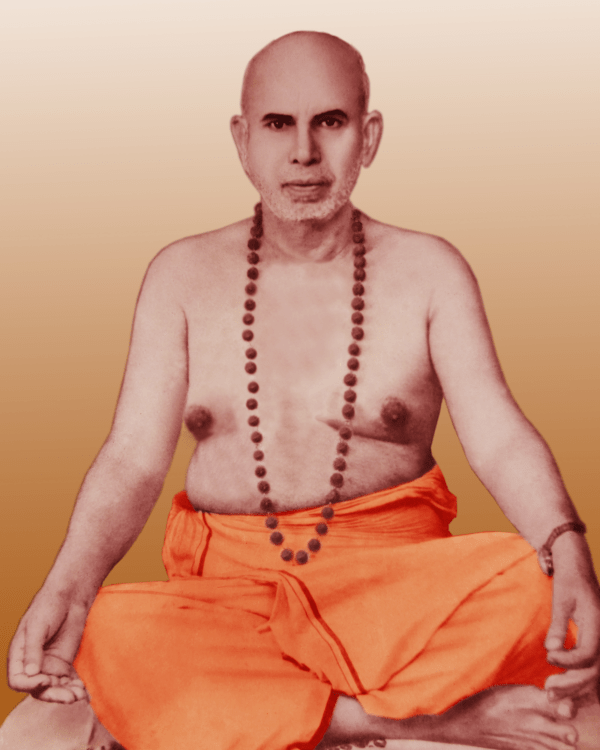 Swami Agamananda worked for 25 years, took up various socio –religious activities. He fought against Casteism which was so thick, which prompted Swami Vivekananda to call Kerala as a “lunatic asylum”. Swami Agamananda conducted temple-entry proclamation with lower classes. He started various charitable activities for Schedule Castes and Schedule Tribes. The Brahmanandodayam Sanskrit School was started in May 1937. Foundation stone for the first school building was laid on 02-05-1937 by Swami Agamananda. The building was formally opened by Dr. C. P. Ramaswami Iyer, the then Dewan of Travancore, on 04-02-1938. In the year 1947 this school was converted into the new type Sanskrit School in which Sanskrit became the first language. The present 5th ,6th & 7th standards constitute the Brahmanandodayam Sanskrit upper primary school of the new type. The school had 12 divisions during 1974-75. Brahmanandodayam High school started in 1947. A primary section was added to the above schools in 1950. The Universal temple of Sri Ramakrishna attracts devotees in thousands. Gurukula has grown into Tribal Hostel, now with 102 students under the guidance of Ministry of Social Justice Govt of India. Sri Ramakrishna Gurukulam started in 1936 with 2 free students.The scheme of a Tribal Hostel was sanctioned by the Govt. of India in 1961. It is housed in a two-storied building with a spacious prayer-hall. A kitchen and dining hall was added to it in 1968. It started functioning in 1964-65 with 60 Tribal boys drawn from the six districts of Kerala. A college in the name of Sri Sankaracharya was an ambition of Swamiji . Overcoming many hardships he could fulfill his dream. Swamiji could not continue with that for lack of funds . Due to financial liabilities he had to surrender it to some other trust. The Ayurvedic Dispensary started during 1951. 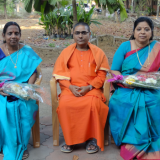 Pleased in the Ashrama activities the Diwan of Travancore allowed more than 100 acres of forest land for the running expenses of the Ashrama. Out of this only about 32.26 acres of land in the possession of the Ashrama for agricultural purposes. Sri Ramakrishna Adviata Ashrama took active role in development of Kalady. New Roads, layouts, electrification and water supply facilities came up due to the active involvement of Ashrama in making the Public facilities happen. Many associations, groups, people and youngsters came worked under the inspiration of the Ashrama. Kalady Dr. Rajendra Prasad, President of India once visited Kalady Ashrama . Swami Agamanand brought to his notice the need of a brigde across River Periyar to connect the either side The bridge was constructed in 1965 with the intervention of the President of India. People of Kalady still owe this Bridge to the efforts of Swami Agamananda. The weaving School continued to function till 1971 in a small scale. Need of a community centre for Harijans at Mattoor near kalady was felt long. Harijans and other backward communities round about Mattoor had neither a public place for congregational prayers, nor an auditorium for recreational activities. In 1971 thirteen cents of land was purchased and a building was constructed. The building provides a stage, community hall and a library. Weekly Bhajan, moral and religious classes are conducted at the centre. The computer training centre and Typewriting Centre helps a number of young job seekers. The sub centre of Ashrama at Muvathupuzha is the spiritual centre at that village.